To do this, the NSA needed a new kind of employee. The TAO workers authorized to access the special, secure floor on which the unit is located are for the most part considerably younger than the average NSA staff member. Their job is breaking into, manipulating and exploiting computer networks, making them hackers and civil servants in one. Many resemble geeks — and act the part, too. A favored tool of intelligence service hackers is “QUANTUMINSERT.” GCHQ workers used this method to attack the computers of employeesat partly government-held Belgian telecommunications company Belgacom, in order to use their computers to penetrate even further into the company’s networks. The NSA, meanwhile, used the same technology to target high-ranking members of the Organization of the Petroleum Exporting Countries (OPEC) at the organization’s Vienna headquarters. In both cases, the trans-Atlantic spying consortium gained unhindered access to valuable economic data using these tools. To conduct those types of operations, the NSA works together with other intelligence agencies such as the CIA and FBI, which in turn maintain informants on location who are available to help with sensitive missions. This enables TAO to attack even isolated networks that aren’t connected to the Internet. If necessary, the FBI can even make an agency-owned jet available to ferry the high-tech plumbers to their target. This gets them to their destination at the right time and can help them to disappear again undetected after as little as a half hour’s work. Specialists at the intelligence organization succeeded years ago in penetrating the company’s digital firewalls. A document viewed by SPIEGEL resembling a product catalog reveals that an NSA division called ANT has burrowed its way into nearly all the security architecture made by the major players in the industry — including American global market leader Cisco and its Chinese competitor Huawei, but also producers of mass-market goods, such as US computer-maker Dell. These NSA agents, who specialize in secret back doors, are able to keep an eye on all levels of our digital lives — from computing centers to individual computers, and from laptops to mobile phones. For nearly every lock, ANT seems to have a key in its toolbox. And no matter what walls companies erect, the NSA’s specialists seem already to have gotten past them. Another program attacks the firmware in hard drives manufactured by Western Digital, Seagate, Maxtor and Samsung, all of which, with the exception of the latter, are American companies. Here, too, it appears the US intelligence agency is compromising the technology and products of American companies. This is the continuing saga of Monsanto et al to optimize their business model which is coming under increasing challenge and outright rejection by consumers. What bothers me is just how few have been able to stand up to them. So far it has been on the edges. What it going to kill this is surely the biology itself. The cost structure is already creaking and the absolute need to properly rejuvenate soils just to sustain fertility is a natural deadline. Super weeds are also signaling failure. At the same time, conversion to organic protocols is becoming more clearly understood and easier to implement. Once begun there is no going back. I am disturbed by the attempt by these multinationals to write their advantage into any trade agreement. That it infers surrendering sovereignty to Trans national corporation seems wishful thinking but we must remain vigilant. According to an Acres USA interview of plant pathologist Don Huber, Professor Emeritus at Purdue University, two modified traits account for practically all of the genetically modified crops grown in the world today. One involves insect resistance. The other, more disturbing modification involves insensitivity to glyphosate-based herbicides (plant-killing chemicals). Often known as Roundup after the best-selling Monsanto product of that name, glyphosate poisons everything in its path except plants genetically modified to resist it. Glyphosate-based herbicides are now the most commonly used herbicides in the world. Glyphosate is an essential partner to the GMOs that are the principal business of the burgeoning biotech industry. Glyphosate is a “broad-spectrum” herbicide that destroys indiscriminately, not by killing unwanted plants directly but by tying up access to critical nutrients. Because of the insidious way in which it works, it has been sold as a relatively benign replacement for the devastating earlier dioxin-based herbicides. But a barrage of experimental data has now shown glyphosate and the GMO foods incorporating it to pose serious dangers to health. Compounding the risk is the toxicity of “inert” ingredients used to make glyphosate more potent. Researchers have found, for example, that the surfactant POEA can kill human cells, particularly embryonic, placental and umbilical cord cells. But these risks have been conveniently ignored. The widespread use of GMO foods and glyphosate herbicides helps explain the anomaly that the U.S. spends more than twice as much per capita on healthcare as the average developed country, yet it is rated far down the scale of the world’s healthiest populations. The World Health Organization has ranked the U.S. last out of 17 developed nations for overall health. Sixty to seventy percent of the foods in U.S. supermarkets are now genetically modified. By contrast, in at least 26 other countries—including Switzerland, Australia, Austria, China, India, France, Germany, Hungary, Luxembourg, Greece, Bulgaria, Poland, Italy, Mexico and Russia—GMOs are totally or partially banned; and significant restrictions on GMOs exist in about sixty other countries. A ban on GMO and glyphosate use might go far toward improving the health of Americans. But the Trans-Pacific Partnership, a global trade agreement for which the Obama Administration has sought Fast Track status, would block that sort of cause-focused approach to the healthcare crisis. Roundup-resistant crops escape being killed by glyphosate, but they do not avoid absorbing it into their tissues. Herbicide-tolerant crops have substantially higher levels of herbicide residues than other crops. In fact, many countries have had to increase their legally allowable levels—by up to 50 times—in order to accommodate the introduction of GM crops. In the European Union, residues in foods are set to rise 100 to 150 times if a new proposal by Monsanto is approved. Meanwhile, herbicide-tolerant “super-weeds” have adapted to the chemical, requiring even more toxic doses and new toxic chemicals to kill the plant. Human enzymes are affected by glyphosate just as plant enzymes are: the chemical blocks the uptake of manganese and other essential minerals. Without those minerals, we cannot properly metabolize our food. That helps explain the rampant epidemic of obesity in the United States. People eat and eat in an attempt to acquire the nutrients that are simply not available in their food. More than 40 diseases have been linked to glyphosate use, and more keep appearing. In September 2013, the National University of Rio Cuarto, Argentina, published research finding that glyphosate enhances the growth of fungi that produce aflatoxin B1, one of the most carcinogenic of substances. A doctor from Chaco, Argentina, told Associated Press, “We’ve gone from a pretty healthy population to one with a high rate of cancer, birth defects and illnesses seldom seen before.” Fungi growths have increased significantly in U.S. corn crops. In light of these adverse findings, why have Washington and the European Commission continued to endorse glyphosate as safe? Critics point to lax regulations, heavy influence from corporate lobbyists, and a political agenda that has more to do with power and control than protecting the health of the people. In the ground-breaking 2007 book Seeds of Destruction: The Hidden Agenda of Genetic Manipulation, William Engdahl states that global food control and depopulation became U.S. strategic policy under Rockefeller protégé Henry Kissinger. Along with oil geopolitics, they were to be the new “solution” to the threats to U.S. global power and continued U.S. access to cheap raw materials from the developing world. In line with that agenda, the government has shown extreme partisanship in favor of the biotech agribusiness industry, opting for a system in which the industry “voluntarily” polices itself. Bio-engineered foods are treated as “natural food additives,” not needing any special testing. Whether or not depopulation is an intentional part of the agenda, widespread use of GMO and glyphosate is having that result. The endocrine-disrupting properties of glyphosate have been linked to infertility, miscarriage, birth defects and arrested sexual development. In Russian experiments, animals fed GM soy were sterile by the third generation. Vast amounts of farmland soil are also being systematically ruined by the killing of beneficial microorganisms that allow plant roots to uptake soil nutrients. As the devastating conclusions of these and other researchers awaken people globally to the dangers of Roundup and GMO foods, transnational corporations are working feverishly with the Obama administration to fast-track the Trans-Pacific Partnership, a trade agreement that would strip governments of the power to regulate transnational corporate activities. There is a safer, saner, more earth-friendly way to feed nations. While Monsanto and U.S. regulators are forcing GM crops on American families, Russian families are showing what can be done with permaculture methods on simple garden plots. In the U.S., only about 0.6 percent of the total agricultural area is devoted to organic farming. This area needs to be vastly expanded if we are to avoid “the sixth mass extinction.” But first, we need to urge our representatives to stop Fast Track, vote no on the TPP, and pursue a global phase-out of glyphosate-based herbicides and GMO foods. Our health, our finances and our environment are at stake. Ellen Brown is an attorney, president of the Public Banking Institute and the author of twelve books, including the best-selling Web of Debt. In The Public Bank Solution, her latest book, she explores successful public banking models historically and globally. Her blog articles are at EllenBrown.com. With little fanfare or public notice, the Obama administration has pushed full speed ahead over the past year with negotiations on the Trans-Pacific Partnership (TPP), a so-called free trade agreement loaded with potential for enormous political and economic harm for Americans. The TPP, which currently involves 12 nations — Australia, Brunei, Canada, Chile, Malaysia, Mexico, New Zealand, Peru, Singapore, the United States, and Vietnam (Japan is negotiating for membership and is likely to join soon) — is really intended as an interim arrangement, on the road to an expanded Free Trade Area of the Asia Pacific (FTAAP) that would include all 21 nations of the grouping known as the Asia-Pacific Economic Cooperation (APEC). That includes China and Russia. The architects and promoters of the TPP and FTAAP frequently point with admiration to the “integration” process of the European Union (EU) as the model they would like to see implemented for the Asia-Pacific rim nations. As with the Transatlantic Trade and Investment Partnership (TTIP), the Trans-Pacific Partnership has been designed to follow the EU example of relentless widening and deepening, constantly eroding national sovereignty, while building “transnational governance” that is not restrained by the checks and balances of national constitutions. If there is one word that is used more often than “reform” by governments, politicians, and international organizations — and abused even more frequently and egregiously — it is “transparency.” As with the United Nations and the World Trade Organization (WTO), the White House and the U.S. Trade Representative’s (USTR) office regularly proclaim their commitment to transparency while doing everything possible to hide their actions from their constituents. The USTR’s “Fact Sheet: Transparency and the Trans-Pacific Partnership” is intended to give the impression that the Obama administration is forthrightly providing the American people with all the up-to-date information they need to accurately evaluate the agreements that are being made in their name, and that would, if accepted by Congress, devastatingly impact their lives, their liberty, and their future. USTR invited over 250 Civil Society stakeholders to a briefing held on June 19, 2012 and provided non-governmental organizations the opportunity to discuss specific issues with USTR negotiators. USTR will continue to engage with stakeholders to find ways to increase transparency in the TPP negotiations, while moving ahead toward an innovative, groundbreaking 21st-century trade agreement that will support more jobs for working Americans here at home. The Obama administration’s standard response to any question or objection is to replay the all-purpose, shop-worn mantra that it — and the Bush and Clinton administrations before it — monotonously, mindlessly intones: “More trade equals more jobs and more prosperity…. More trade equals more jobs and more prosperity.” End of discussion, end of debate. This is the same lineup of “Civil Society Organizations” (CSOs) that is providing faux grassroots participation for the TTIP planned economic and political merger of the United States with the EU (see our article “EU/U.S. — Transatlantic Convergence“). No surprise there; we have seen the same CSO/NGO players engaged in the same deceptive games during the battles over the North American Free Trade Agreement (NAFTA), the Central American Free Trade Agreement (CAFTA), the Free Trade Area of the Americas (FTAA), the Security and Prosperity Partnership (SPP), the World Trade Organization (WTO), and the many other trade-agreement fights. The purpose of these sham opposition groups is to foster the false perception of widespread public involvement in the TPP process and strong public consensus for the TPP objectives. Even when these “opposition” groups publicly object to truly objectionable features of these trade agreements, it is usually for the wrong reasons, and invariably they argue that the proposed new trade authority be given more powers and go beyond trade issues to deal with the environment, labor, financial services, etc. By establishing themselves as the noisiest adversaries, and the only ones the establishment politicians and media deem credible, they successfully co-opt the opposition label and prevent any genuine opponents from rising to the fore. Then they can be counted on to fold, sell out, or walk out at the critical moment and leave the field wide open for passage of the agreement. Not surprisingly, virtually all of these ostensibly grassroots organizations are actually astro-turf groups funded by grants from government agencies, the big tax-exempt foundations, major corporations, and big labor unions. The TPP proponents are only too happy to accommodate this fake vox populi; as with the TTIP, they are including virtually everything — including the kitchen sink — in the Trans-Pacific Partnership. The White House, the USTR, the State Department, and the private organizations promoting the TPP openly admit that this agreement is not simply a trade agreement, not simply about lowering tariffs. It encompasses — among other things — customs, telecommunications, investment services, technical barriers to trade, sanitary and phytosanitary measures, intellectual property, regulatory coherence, development, non-conforming measures and cross-border trade in services, rules of origin, competition, agriculture, textiles, and environment. Each of these “deepening” areas is pregnant with incredible potential for havoc. Another TPP draft document leaked last year would require the United States to agree to exempt foreign corporations from our laws and regulations. Foreign businesses could challenge any of our federal, state, or local laws and regulations as being unfair practices in restraint of trade. Who would adjudicate these types of cases? They would be decided by an international arbitration tribunal overseen by the secretary-general of the United Nations. This is an all-out assault on national sovereignty, unconstitutionally transferring legislative powers from the U.S. Congress; state legislatures; and local, city, and county governments to unaccountable international bureaucrats, and judicial powers from our federal and state courts to black-robed TPP globalists. It would also confer huge advantages on foreign businesses and large multinationals, while concomitantly putting American businesses — especially small and medium-sized enterprises — at a competitive disadvantage. American businesses would remain shackled with the onerous regulatory burden of EPA, FDA, ADA, OSHA, etc., while their foreign competitors could operate here unimpeded by those same strictures. How many more similar dangers (or worse) are hidden in the TPP texts? Based on what has already been leaked so far, should Congress not already be demanding total transparency, with full and immediate access to all of the TPP negotiation texts? The “TPP chapter texts cannot be released to the public”! That’s the Obama administration’s “transparency”! We mentioned at the beginning of this article that the TPP is actually intended as a door opener to an even larger and more ambitious Free Trade Area of the Asia Pacific (FTAAP). That is not merely the conjecture of this writer; U.S. officials and the original architects of the TPP have stated this explicitly. Over time, the TPP is expected to evolve into a major integration arrangement covering most of the members of the Asia-Pacific Economic Cooperation (APEC) forum. The TPP is regarded as an interim arrangement or stepping stone toward a broader, regionwide Free Trade Area of the Asia Pacific (FTAAP), possibly within a decade, as envisaged by APEC leaders in Bogor [Indonesia] in November 1994 and reaffirmed more recently by them in their meeting in Honolulu in November 2011. TPP negotiators are not only thinking about new countries joining the ongoing talks but also planning and constructing the trade pact with a view toward future linkages with other APEC members, including and especially China. The current TPP architects envision building an eventual FTAAP on the comprehensive foundations of the TPP accord, with other APEC countries joining the pact in coming years. Those familiar with Dr. Bergsten’s background and connections recognize that these admissions are all the more important because he, Schott, and the other PIIE authors are channeling the party line of the Council on Foreign Relations (CFR) and the Trilateral Commission (TC), two of the most influential globalist organizations pushing for a New World Order that envisions a global monetary authority and a world government under the United Nations. Bergsten is a longtime member and leading intellectual of both the CFR and TC. The PIIE is named for and chaired by Peter G. Peterson, a longtime chairman of the CFR. The PIIE board of directors and advisory board, as well as its roster of scholars and fellows, is a register of prominent CFR and TC members, including David Rockefeller, former chairman of the CFR and founder of the TC. Many of the PIIE’s leaders have held Cabinet positions in various administrations. Leading the Obama TPP/FTAAP effort are CFR/TC members Michael Froman (U.S. trade representative) and Robert Hormats (undersecretary of state). During the George W. Bush administration, U.S. Trade Representative Susan Schwab (CFR) praised APEC at the organ­ization’s 2007 meeting in Cairns, Australia, and endorsed the FTAAP. The dangers of the TPP are becoming daily more obvious. The secrecy of the TPP negotiation process and the threats to national sovereignty that have already been exposed due to leaks of text drafts show it to be incompatible with our American constitutional system. The fact that its authors and promoters admit the TPP is just a “steppingstone” to an even more expansive and more dangerous FTAAP, should be sufficient to guarantee its defeat. However, defeating the TPP and FTAAP will require a coordinated, sustained effort by American patriots over the next few months to take this information to their fellow citizens. It will take — in the words of Samuel Adams — “an irate, tireless minority keen to set brush fires in people’s minds.” And then the heat and light from those brushfires must be directed at members of Congress so that they will honor their constitutional duty to stop the TPP. We have many heroes in our midst and some of the most tireless and courageous are those who have been very active in the 9/11 Truth movement for over ten years. It is impossible to overstate the importance of recognizing the magnitude of damage done to the American republic from the 9/11 false flag attack. It was the fulcrum event launching the global war on terror resulting in the deaths of thousands of US soldiers, disabling many more, killing millions of innocent civilians in the middle east and devastating the lives of tens of millions. The effects at home have been nothing short of catastrophic as (1) a steady metastasis of an encroaching police state eviscerates our Constitution and civil liberties; (2) a black hole of military expenditures accelerates America’s trajectory into fiscal insolvency; and (3) as an event that provided a smokescreen for large scale criminal activity to include financial and corporate crime. The 9/11 false flag could be said to be the second major coup, after JFK’s assassination, to be foisted on a mostly unsuspecting American public ultimately intended to deprive us of our God given rights to freedom, dignity, and self determination, gifted to us by the greatest minds of the Enlightenment and the countless men and women who made the ultimate sacrifice for generations of Americans. 9/11 spawned a form of malignant cancer on our civilization that must be exposed now at this critical juncture in our collective history. Thankfully, the 9/11 Truth movement is still working hard to educate the public and has written extensively and produced documentaries to that end. The most recent 9/11 Truth film “September 11: The New Pearl Harbor” is a brilliant example, utilizing expert researchers who “knock it out of the ballpark” and thus shame disinformation propagandists as establishment buffoons. While the subject matter is sobering, to say the least, never before have I relished an opportunity to cheer on the “good guys”. Please watch the documentary in full and then share this with everyone you know and in as many internet forums and networks as you possibly can so we can come together as one voice to defend our basic human rights. May God bless those fighting the good fight for Truth, Justice, and Freedom. Here are links from a different source in case there’s trouble with the above one. This series of films should be watched by every person in America, and I mean if you do not do everything in your power to watch it and then demand everyone you know watch it, then you are not worthy of calling yourself an American. We can no longer tolerate the people sitting on their hands while America burns to the ground. • With some of the amendments, secure certain civil rights. But for 100 years, almost everyone in our Country has ignored our Constitution. Thus, instead of restricting spending to the enumerated objects of its powers, the people we send to Congress spend money on what anybody wants- and so gave us a debt of $17 trillion. Instead of restricting lawmaking to the enumerated objects of its powers, the people we send to Congress make laws on whatever they like. 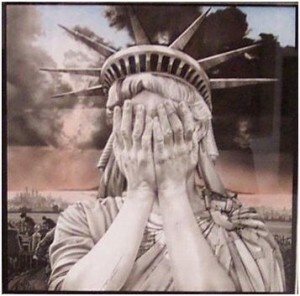 The President we elected tramples all over the Constitution; and due to the connivance, cowardice, and ignorance of Congress, the supreme Court, State governments, and the American People, is seizing totalitarian power. One side proposes that we learn & enforce our existing Constitution of limited & enumerated powers. We show that our Framers advised us to enforce our Constitution by (1) electing better representatives to annul the acts of the usurpers, or by (2) nullification of unconstitutional acts. But the Randy Barnett/ Rob Natelson/ Michael Farris/ Mark Levincamp want a “convention” so they can gut our existing Constitution by amending out the limited & enumerated powers with new amendments which grant general powers to the federal government; or they seek to re-write the Constitution altogether. It has already been shown how the so-called balanced budget amendment would transform our Constitution from one of enumerated spending powers to one of general spending powers, where spending would be limited only by the amount of revenue the federal government generates or a certain percentage of the GDP. But under our existing Constitution, the federal government’s expenditures are limited by the constitutional grants of authority – the enumerated powers. The problem is everyone ignores the enumerated powers – they never learned what they are! And Mark Levin’s suggested amendments would gut our Constitution. Most increase the powers of the federal government by making constitutional what is now unconstitutional because it is not an enumerated power. The amendments pertaining to “overrides” undermine the Constitution as the objective standard of what is lawful and what is not – and substitute majority vote therefore. These “overrides” would erase the Constitution and replace it with majority (mob) rule. So! Since Article V vests in Congress the power to call the convention; and since Article I, §8, last clause, vests in Congress the power to make all laws necessary & proper to execute its delegated powers; Congress would be within its constitutional authority to organize the Convention anyway it wants, and to appoint whomsoever it wishes as delegates. “How was a Convention to be formed? – by what rule decide? – what the force of its acts?” (Sep. 10); and “difficulties might arise as to the form, the quorum, & c., which in constitutional regulations ought to be as much as possible avoided”(Sep. 15, 1787). He proposes “to take power away from Washington D.C.”[power the federal government has usurped] by “re-calibrate[ing] the rules”. The Creator God who, as recognized by our Declaration of Independence, endowed us with unalienable rights; assigned to parents the responsibility to provide for the education &moral instruction of their children: Proverbs 1:8-9, 6:20-21, 13:1, 22:6 & 23:19-22; Genesis 18:19; Deuteronomy 4:9-10 & 6:1-7; Ephesians 6:1-4; 2 Timothy 1:5 & 3:15-17. Because your States sold your God-given responsibility to educate your own children-and your reserved power to do so-to the federal government. This has been going on for a long time; but most recently your State sold you out for federal grants with the federal government’s “race to the top” and “common core” schemes. You have to be ignorant, unthinking,& gullible – a greenhorn -to believe that The States are the men in the white hats who can fix all this with a convention to propose amendments. 1. Use your own head! Do not be manipulated by other peoples’ choice of words. Rob Natelson formerly referred to what he wants as a “constitutional convention”. Now, he calls it a “Convention of the States” – that is the term his cohorts & minions now use. Why did they change what they called it? 2. But our elections are no longer honest. The States took federal grant money to buy voting machines which can be rigged. 3. Randy Barnett’s “Bill of Federalism” is ten proposed amendments which would transform our Constitution from one of enumerated powers to one of general & unlimited powers. Mark Levin’s proposed amendments are similar to Barnett’s. 4. The GDP is computed by an agency in the Executive Branch. So under the BBA, spending would be limited by numbers under the control of the federal government: By how much they tax you; or by a number (GDP) the Executive Branch computes.You think that is a fine idea? 5. The Federalist Papers tell us what the “necessary & proper” clause (Art. I, §8, last clause) means: The clause delegates to Congress power to pass all laws necessary & proper to execute its declared powers (Federalist No. 29, 4th para); a power to do something must be a power to pass all laws necessary & proper for the execution of that power (Federalist No. 33, 4th para); “the constitutional operation of the intended government would be precisely the same if [this clause] were entirely obliterated as if [it] were repeated in every article” (Federalist No. 33, 2ndpara); and thus the clause is “perfectly harmless”, a tautology or redundancy. (Federalist No. 33, 4thpara). See also Federalist No. 44, 10th-17thparas. In other words, the clause permits the execution of powers already declared and granted. Do not be misled by Rob Natelson’s post on the “necessary & proper” clause! Why did Natelson ignore what The Federalist Papers say about this clause? Why did he fabricate the song & dance set forth in his post? 6. Think this through also: Even if Congress, as a matter of grace, permitted the States to appoint delegates, how would delegates from your State be chosen? Who controls your State? Would the powers in your State choose you? Or do you believe Michael Farris would choose the leaders? 7. This happened in your State because The People in your State elected to State government people who sold you out. See this website on federal grants: You think your State Legislators, who have been gobbling up all the federal grant money they can get, will fix our Country at a “convention” to propose amendments? Farce of Globalism: World Bank Becomes Top Cop? Corruption top foe in developing countries: World Bank … World Bank chief Jim Yong Kim said Thursday that corruption was the top problem faced by developing countries as he unveiled a new weapon to root out graft. Kim said the private sector should be “part of the solution.” “Oil, gas, and mining firms are increasingly disclosing their contracts with governments,” he said, providing “a chance” to monitor the activities of both corporate and public officials. Kim announced that the World Bank will create a single pool of technical experts in rule of law, public sector, financial and state management, and public procurement as a major tool to fight corruption. This is surely part of the evolution of internationalism, as we have been tracking it. How can you tell? Just look at the main elements of Western control set up after World War Two. Among them are the United Nations, World Bank, IMF and NATO. Each of these organizations is continuously expanding. Also, we can tell by who created them that the Western banking establishment is behind them. The Cold War, a somewhat manufactured crisis, in our opinion, was responsible for the expansion of NATO and the UN. “Caring” for impoverished countries and people was responsible for the expansion of the World Bank and NATO. Of course, we know from various exposes that the IMF and World Bank do not deal directly with people they are supposed to be helping. Instead, their officials make deals with top bureaucrats. The bureaucrats are basically bribed to take huge handouts from the World Bank to “improve” public facilities, etc. When the expansions sour due to bribe taking and corruption, the bureaucrats in charge vanish, often to other countries or luxurious retirements on various tropical islands. The next generation of bureaucrats is left to deal with the bitter dregs of wasted funding. Then the IMF swoops in to lend money at high cost to allow the country’s unsuspecting population to pay back IMF “loans.” Population after population has been rightfully shocked to find out that its countries are bankrupt and public facilities like waterworks are up for sale to the highest bidder. Make that “low bidder,” as multinationals surreptitiously controlled by the globalist banking community pay very little for acquisitions. And then, of course, the prices of basic services are raised considerably to those who depend on them. Thus vast corporate creatures – handmaidens of a global elite – are continually acquiring fundamental resources as they centralize power and authority to benefit a blossoming international governance. All this has been done behind the scenes, but now as what we call the Internet Reformation continues to expose the Way the World Really Works, those who are committed globalists have sped up the apparent takeover. Every day it seems the IMF is more activist, with its top people rallying around the idea that the IMF should become the world’s central bank. The UN meanwhile drives hundreds of leaders of various corrupt countries into vast conferences that produce global resolutions on everything from trade to environmentalism and, of course, the pseudo science of global warming. And now, it seems, a new task has been found for the World Bank. It will be to clean up corruption. The IMF is not suited to be the world’s central bank because monopoly central banks don’t work, because the IMF’s SDR scrip is inefficient and because the IMF generally is a corrupt and useless body, filled with grasping bureaucrats who understand quite well the gap between the IMF’s stated goals and reality. The UN has always been an entirely corrupt body – an authoritarian, even fascist government in waiting. It is inefficient, wasteful, ruinous and just as hypocritical as the IMF or other world bodies. As for the World Bank, its corruption is so extensive that one is almost tempted to say it is indeed the organization that should monitor corruption worldwide because of its extensive internal experience. … It’s presidential inauguration time in Washington. Not for the person who will helm the federal government – that comes in six months – but instead for Dr. Jim Yong Kim, the man taking the reins of an organization even more lumbering, and far less accountable: the World Bank. And – according to dozens of interviews over the past few weeks, atop hundreds more over the past five years, plus a review of thousands of pages of internal documents – problems have gotten worse, not better, at the World Bank despite more than a decade of reform attempts. Kim, the Dartmouth College president tapped by President Obama to lead the bank, stands little chance of fixing things, say insiders, unless he is prepared to completely revamp the current system. The inmates are running the asylum, says a former director. – Part of the problem is structural: Internal reports, reviewed by FORBES, show, for example, that even after Zoellick implemented a budget freeze some officials operated an off-budget system that defies cost control, while others used revolving doors to game the system to make fortunes for themselves or enhance their positions within the bank. – Why not track all the cash? Good luck: Bank sources cite up to $2 billion that may have gone unaccounted for recently amid computer glitches. – Sadly, the last part is cultural: The bank, those inside and outside it say, is so obsessed with reputational risk that it reflexively covers up anything that could appear negative, rather than address it. – Whistle-blower witch hunts undermine the one sure way to root out problems at a Washington headquarters dominated by fearful yes-men and yes-women, who – wary of a quick expulsion back to their own countries – rarely offer their true opinions. – In 2005 George W. Bush tapped Paul Wolfowitz as president to clean the place up. To his credit, Wolfowitz made rooting out corruption his primary mission. But the former Pentagon official also came in like an occupying power. According to internal documents obtained by FORBES, the board and Wolfowitz engaged in a game of trench warfare so vicious that the minutes of some board meetings had to be sanitized to keep the world from knowing what was really going on. – Numerous managers and vice presidents that I spoke with inside the bank say that corruption continues unabated. Five years ago a commission led by Paul Volcker drilled into the bank and called it a massive problem. We can see from the above that the idea of the World Bank leading the fight against international sociopolitical corruption is generally farcical. And I have not even touched on the “transparency meme” being cultivated by the same rogues and rascals running these vast repositories of waste. Central banks are trying very hard to be transparent, for instance, but their function is essentially one of criminal incompetence. No matter the stated reasons, central banks are in the business of bankrupting the middle class on a regular basis and then assuming those bankrupt assets at minimal cost. The reason that these enormous global facilities are receiving more and more power and authority is not because they work well or even work at all. It is because the internationalists who set them up want them to expand as a way of building world government. Call it directed history. These agents of globalism will continually acquire power no matter the reality of their missions. They were never what they appeared to be. In the 21st century, it becomes increasingly apparent as the Internet Reformation era advances. One such source list of the ownership of the Federal Reserve, compiled by Thomas D. Schauf appears on The Federal Reserve Scam! However, before getting to the particulars of the actual families behind the central banking cabal, it is important to go directly to the source of the primary chronicler who investigated and exposed the scheme. The late, Eustace Mullins – Secrets of The Federal Reserve, video reveals the entire sordid background. Now review 25 Fast Facts About The Federal Reserve You Need To Know, from ETF Daily News that advises investors. The way these items play into the central banking model practiced by all 187 nations that belong to the IMF, demonstrates that banksters of the most select rank, are behind continued debt bubbles that are strangling the world. Watch the video above by G Edward Griffin Creature From Jekyll Island A Second Look at the Federal Reserve. Mr. Griffin explains the broad picture in simple and clear terms. With such definitive information available and widely known within financial circles, why is the public so content to remain in the dark? They live under the aftermaths of the Federal Reserve is a Cache of Stolen Assets, but resign themselves to the oblivion of lost expectations and the burden of diminished opportunities. Think about who really owns the land, the buildings and the resources in our country. In order to really understand the scope and extent of the economy, the differential between actual Main Street enterprise, that feeds, clothes and shelters the population, is minuscule when compared to the financial assets, both liquid and real property, that is under the command and control of the central bank. The political class and the business establishment simply refuse to buck the controllers of the currency. 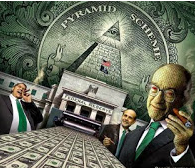 Attempts for a Jackals of Jekyll Island – Federal Reserve Audit, are pushed aside because any accountability for the Fed would ripple throughout the entire world fiat paper banking system. “The FED’s grip on the global moneychangers’ racket is based upon maintaining the U.S. Federal Reserve funny money, as the reserve currency for the planet. The value and worth of Treasury Bills and Bonds are on the path to have the value of. 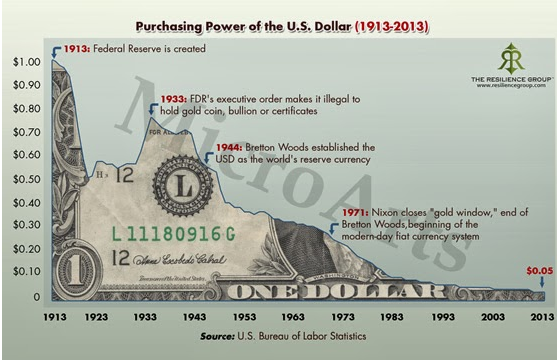 Since the adoption of a private banking, money creation venture, the dollar has lost virtually its entire store of value. The currency has lost its universal acceptance, as multiple alternatives circulate to replace its reserve status. This failure to maintain and preserve the integrity of the dollar is no accident. The actual purpose of the architects of the Federal Reserve System has never changed. Consolidate the control of money into a concealed cartel of banking houses that ultimately decide economic and political policy. Dispensing of credit to corporatist projects, owned or run by reliable operatives of the cabal is the objective. The only beneficiaries are the original stockholders. For the rest of Americans, the Federal Reserve conspiracy is an ongoing theft syndicate. It only takes the will to admit the undeniable. Without the courage to abolish this usury monster, the next century will witness the total destruction of the country. You are currently browsing the A NATION BEGUILED blog archives for December, 2013.